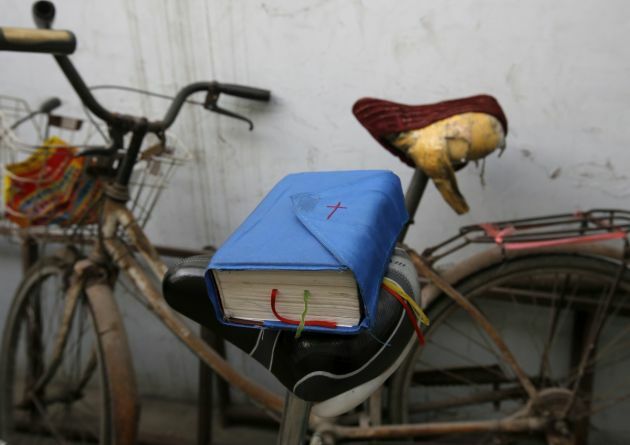 (Photo: REUTERS / Kim Kyung-Hoon)A bible is placed on a bicycle saddle at an underground Catholic church in Tianjin, China November 10, 2013. A Chinese court has released eight Christians who tried to stop authorities demolishing a church in Wenzhou last year, after they entered a plea bargain in which they owned up to the charges against them. The Christians pleaded guilty to the charge of assembling a crowd illegally at the Sanjiang Church, an act which could have been an outcome of coercion, a U.S.-based Christian rights group, China Aid, said. Among those whom the court freed March 25 was Pastor Zhao Rendi, who received a three-year sentence for the crime, ucanews.com reported. Zhao was mobbed by supporters as he emerged from the courtroom on Wednesday, walking away on provisional liberty after the judge allowed him to post bail. Others accused, including church elder Guo Yunhua and six others, received sentences ranging from two months to a year. Their plea bargain agreement allowed them a reprieve from prison for several months. "Thank the Lord! [Pastor] Zhao's brothers who opposed the demolition of Sanjiang Church were released in court this afternoon," wrote Pastor Zhong Lin of Chengdu on China microblogging site Weibo. China's State-sanctioned media barely reported the outcome of the case, which has drawn anger from Christians in Wenzhou, known as the "Jerusalem of the East" because of more than a million Christians residing there. Some observers said the verdict appeared as a conciliatory move as authorities seemed to be treading lightly following the outrage of Christians who opposed State-sponsored crackdown on churches and places of worship in 2014. The provincial government had removed over 400 crosses, demolishing at least 35 churches across Zhejiang starting late 2013. Zhao's group was among hundreds of protesting Christians who slept outside the church as they picketed against the government's move to tear down the church. Provincial authorities argued that the structure had been five times larger than the initially approved plans, a line that regulators have been using to prevent the rise of Christianity in the province. Last week, another Chinese court sentenced a Protestant pastor to a year in prison for attempting to stop the removal of a cross at a church in Pingyang County.